Citation: Proc. R. Soc. Victoria, n.s., 9: 9. Type Locality: Australia, Northern Territory, Burt Plain (N of Alice Springs). Distribution: N South Australia, S Northern Territory, Great Victoria Desert (Western Australia). 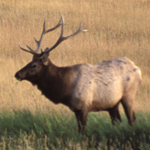 Status: U.S. ESA – Endangered; IUCN – Extinct. Comments: Possibly extinct; see Ride (1970:200).